Now, Australia's rich botanical history has been captured with Ashdene’s Floral Emblems of Australia range – a collection that is inspired by the majesty of the Australian landscape and our very unique natural plants and flowers. 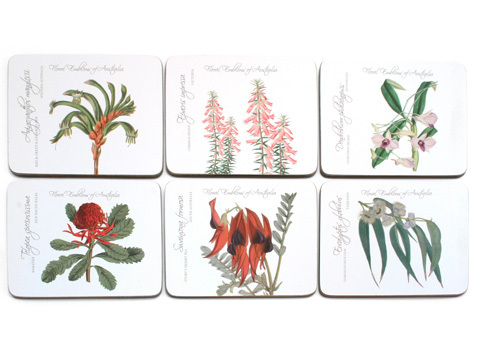 Taking images from the Public Botanical Library Archives in Sydney, each piece in the Floral Emblems range features a stunning full-colour botanical drawing of Australian flora, accompanied with its Latin and common names, as well as the region of Australia that the emblem represents. With mugs, trays and teabag holders within the set, Floral Emblems is the perfect accompaniment to your next afternoon (one served with lamingtons we hope!). Made from cork board with a Durafinish coating. Coasters can withstand heats up to 100˚C. Printed with six different floral designs, along with their Latin and common names, and the region in which the plants grow. Presented as a set of six coordinating coasters in an Ashdene gift box.